The future is rooted in all of us! Rosati-Kain High School has a base of over 6,000 active alumnae. These women are firmly linked with the over 13,000 alumnae who have walked through the doors of R-K since 1911. We hope that this website, and the new alumnae pages in particular, will help you maintain and strengthen your connection to Rosati-Kain. You will find information on upcoming events, details about Alumnae Mass & Brunch, class reunions, news, and photos of what is happening at school. Our alumnae are a vital component of the success of R-K! There are many ways you can be involved, whether it is attending the auction, sending us information about your achievements, or supporting financially the Fund for R-K. We encourage you to contact the Advancement Office at any time to suggest new things or to ask questions! We look forward to hearing from you! Please take a moment to update your contact information so we can keep you informed on everything R-K! 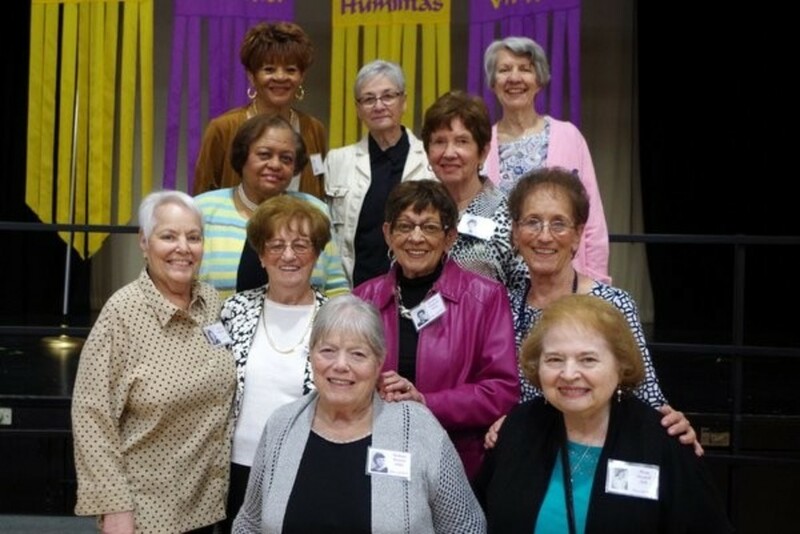 The Rosati-Kain High School Alumnae Community honors a deep tradition of lifelong learning and lasting friendships that connects Rosati women across the country and around the world. Whether you attended R-K for one year or graduated as a “kougar,” we invite you to reconnect with old friends, share your own updates and learn about R-K today. It’s not four years, but for life! The Alumnae Association is back! Please spread the word to your Kougar friends. All R-K Alumnae are invited! Wednesday, June 19th at 6:00 pm: R-K Night at the Ballpark! A group of Alumnae will be gathering in Ballpark Village to watch the St. Louis Cardinals take on the Miami Marlins. To purchase tickets, please click HERE. Would you like to be featured in the next R-K Today? Do you have news to announce such as a special trip, birth, engagement, wedding, new job, promotion, etc.? Send a blurb and photo or a link to the news article to RKdevelopment@rosati-kain.org and we will publish and feature your news! If you have any news to report or questions about the Alumnae eNewsletter, please contact Lisa Svetanics Mitchell ’87, Communications Specialist, at lmitchell@rosati-kain.org. Read the latest news and information about R-K and our community. These publications help us all stay connected to the daily life and traditions of Rosati-Kain and includes the Parents’ Newsletter, R-K Today and The Occasional. Rosati-Kain class rings are forged in tradition and memory, bonding alumnae to R-K and their graduating class. Rings donated to the R-K Ring Konnection, however, are even richer in history. Decades-old rings that may be forgotten about in a jewelry box or left after an R-K alumna passes away are re-connected to current R-K students. Beginning in 2016, alumnae who would like to donate their class rings or those rings of a loved one, can do so by filling out the form attached below and contacting Jen Guidice at rkarchives@rosati-kain.org about delivering the ring. The alumna ring is then paired up with a current Junior who is unable to purchase a ring on her own. In 2013, the Rosati-Kain graduating class participated in the first Alumnae Senior Konnection program, or ASK. As part of this new tradition, each senior asked an alumna to be her graduation sponsor. R-K alumnae – grandmothers, mothers, aunts, sisters, and friends – were represented at graduation and able to offer a special blessing to welcome Rosati-Kain’s newest alumnae into the sisterhood. As part of the ASK mentor program for 2014, ASK mentors and their seniors enjoyed social events throughout the year before graduation. Please click here to view the list of 2016 ASK sponsors and their seniors. Please click here to view the list of 2017 ASK sponsors and their seniors. Please click here to view the list of 2018 ASK sponsors and their seniors. The Advancement Department, in coordination with the Alumnae Association, is excited to offer a new Alumnae Shadowing Opportunity. The shadowing program provides any current Rosati-Kain student with the opportunity to shadow an alumna for one day. This program is available throughout the school year and select days during the summer. This allows students plenty of time to connect with an alumna and to find a date that works for both students and alumnae. Note that the goal of the shadow program is for students to learn more about a career from an alumna already in the field. To get a sense of a “day in the life of … “. This is not a job interview and students will be responsible for their own travel the day of the shadowing opportunity. If you are an R-K alumnae and would like to register to be a part of this shadowing program, please email Jen Shephard Guidic '87 at rkarchives@rosati-kain.org. Class of 1999 - 20th reunion: There will be additional plans for that weekend. Kougar Klassic Happy Hour is Friday, June 28, 4 pm - 6 pm at R-K.
Class of 1979 - 40th reunion: Saturday, September 14th - Dinner at R-K - 5:30 pm doors open, dinner at 6:30 pm. Cost of the evening is $60 per person, There is an option to attend 5 pm Mass at the Cathedral before dinner. Click HERE to make your reservation. Class of 1969 - 50th reunion: Friday, September 20th - Happy Hour at R-K - 6 pm - 9 pm. Hosted in the Learning Commons/Courtyard. Cost is $40/per person. Wine, beer, soda, and heavy appetizers are included. Click HERE to make your reservation. For more information on how you can be a part of one of these reunions or tours, please email Jen Shephard Guidici '87 at rkarchives@rosati-kain.org. 2. Sit-down lunch/dinner: On a mutually agreeable Friday or Saturday. Set menu. Lasts for 3 hours. 3. Rental of the Learning Commons/Courtyard: Flat rate of $300 for use of the space for 3 hours on a mutually agreeable Friday or Saturday. We will only be providing the space. You will be responsible for your own food/drink or caterer and decorations. We can give a tour and will have Kougar Kloset open. Rosati-Kain High School invites you to the Alumnae Mass & Brunch on Sunday, April 28, 2019. Mass at 10am at Cathedral Basilica of St. Louis. R-K doors open at 10:45am. The Charism Award Presentation to Leslie McMurtry Givance '84. We will have Class Recognition for the following graduation year: '39, '44, '49, '54, '59, '64, '69, '74, '79, '84, '89. '94, '99, '04, '09, and '14. Who wants to get together with your fellow R-K Kougars? The R-K Alumnae Association has organized a Kougar Konnection Night in STL for June 19th. It's going to be at Ballpark Village - tickets to the Cards vs. Marlins on the Budweiser Brewhouse Deck. The game starts at 7:15 pm, but arrive at 6 pm to mingle. Tickets are $15, with a limit of 2 tickets per purchaser. To purchase tickets, please click the link below.